The BHS Quad Charger Stand Kit securely holds four wall-mount industrial battery chargers. Its heavy-duty construction ensures that valuable chargers stay firmly fastened in place. Make the most of the space in your battery room by using this highly efficient charger stand. The Quad Charger Stand Kit comes with four long crossbars for mounting chargers side-by-side on the front and back of the stand. Four floor anchors securely fix the stand to the ground. The dense design of the stand allows battery room managers to fit four chargers in a tight space while safely maintaining enough room to access all chargers. Each Quad Charger Stand Kit comes with a choice of charger cable management. 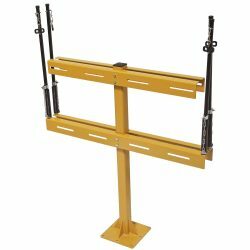 Cable Retractors use a heavy-duty spring with safety chain and a cable clamp to keep cables off the floor. The other option, Magnetic Cable Mounts, can be attached to any flat, ferrous metallic surface, like a charger stand. Efficient cable managers, like BHS Cable Retractors and Magnetic Cable Mounts, allow battery room staff to quickly access charger cables while keeping them untangled, off the floor, and easy to access. Proper cable management increases cable lifespans by reducing kinking, bending, and tangling. It also keeps a battery room floor uncluttered which reduces accidents and injuries. Organize your battery room with a durable and efficient Quad Charger Stand Kit. Contact our sales team at +1 314 423 2075 to learn more or to find a local dealer.